Original Distribution: Original distribution from the Arctic to North Africa, Europe, Eurasia, Central America; however it is now considered an established species in North America as well, although it originated as an introduced species. Site and Date of Introduction: The European Red Fox was introduced in Australia in 1845. Mode(s) of Introduction: Vulpes vulpes was intentionally brought to the continent of Australia mainly for hunting/sport purposes. There is also mention of it being introduced after 1845 for the purpose of controlling the brown hare numbers. Reason(s) Why it has Become Established: Vulpes vulpes is an extraordinary adaptor. Although primarily a predator/carnivore it is also capable of omnivorous behavior, allowing it to forage successfully when prey is scarce. This also aids it’s survival in areas of urbanization, where it’s favored forest habitat has been reduced, as it is capable of foraging through human trash and pet food dishes for sustenance. It is a clever adaptor to habitat changes, and can survive/thrive in all but the most extreme dessert or tropical habitats. The presence of dingoes in a habitat may be one of the few non-climate controlled factors to limit the Red Foxes growth. Additional contributors to the Red Foxes success relate to the unpreparedness of Australia’s native wildlife for the introduction of this predator. The prey species Vulpes vulpes finds in Australia were/are completely defenseless, having to evolutionary experience with the fox. Moreover, the fox has no natural predator to keep its numbers in check. Ecological Role: The Red Fox is primarily a predator. It may in fact be a keystone species in areas where it is distributed naturally, keeping the number of rodents and small mammals in check. In areas where it has been introduced, primarily Australia, its ecological role is as a destructive pest. The Red Fox also contributes to the economy via the legal and regulated trapping and trafficking in its fur in some areas, although this has lessened in the recent years. Benefit(s): As noted above the Red Fox can provide benefits to ranchers, farmers, and urban dwellers by keeping the number of rodents in check. It may also provide balance from an ecological point of view, as a keystone predator for some of its natural range. 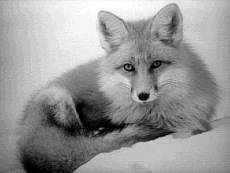 Threat(s): The Red Fox as an introduced species (Australia) is devastating to the native wildlife. The fox may be solely responsible for dozens of small mammal extinctions in Australia. Several species of endangered ground nesting birds, small mammals, amphibians, and reptiles are currently threatened by the fox’s presence in Australia. The Red Fox also contributes to the spread of disease, due to the widespread nature of it’s range and its resistance to population control methods, it could additionally be a key carrier of rabies, were that disease to ever be introduced to Australia. The Red Fox also threatens local livestock due to predation. Control Level Diagnosis: The outlook for the control of this pest in Australia is not bright. Due to its adaptability, it has become firmly entrenched throughout the main landmass of Australia. There have even been possible sightings in the island of Tasmania, which has thus far escaped invasion, much to the benefit of its unique ecology. Most control methods (see below for specific details) are expensive and not effective on a wide scale. However the need for immediate, successful control measures has probably never been greater, with the numbers of endangered species currently threatened by the fox steadily decreasing, as well as the potential for a rabies infected animal introduction increasing daily. Control Method: There are some substantive control mechanisms currently being used, however they are expensive and not terribly successful on a wide scale measurement. The use of the poison 1080 in fox “baiting” is used in some areas of Australia where the poison will not affect the native wildlife. Immunocontraception is a method currently being tested that introduces a chemical that renders the foxes infertile, although this is proceeding slowly due to the recency of this solution, the need for further research, and lack of data that indicates how many foxes must be infertile to control the population. Offering a bounty on foxes has also been explored, although has not proven effective in reducing or controlling the Red Fox numbers due to its expense and inability to target fit foxes for removal. Finally, the fur trade was once a method of control but reduced demand has caused this solution to fall away as well. (Illustrations and Content) Illustrations above are for informational purposes only for this assignment, and should not be published without consent of copyright holders. Vulpes vulpes - Red fox Web site http://www.naturalworlds.org/wolf/canids/Vulpes_vulpes . Red Fox (Vulpes vulpes) http://www.lioncrusher.com/canidae/redfox.htm Information for this page was taken from: Alderton, David. Foxes, Wolves and Wild Dogs of the World. Blandford Press: United Kingdom, 1998.